Santoleri’s inspirations are artists including Albrecht Durer, John Singer Sargent and Andrew Wyeth. in his artists statement he explains “I was lucky enough to meet Andrew Wyeth before he passed away” Santoleri explained. “We discussed a great many things”. When he Wyeth if he was inspired by Durer when drawing Braids , Wyeth replied “I was inspired by Durer in every one of my pieces”. A close mutual artist friend explained to Nick about Andrew Wyeth’s philosophy on creativity. This confirmed Santoleri’s own feeling that artists are merely a medium for a higher artistic spirit wishing to be expressed. “When I’m working on a piece I feel blessed to have the art spirit guide me down the same path”. 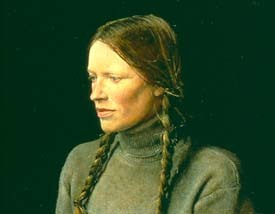 Recently in 2012, at an art show that Nick’s work was displayed in, Helga (Andrew Wyeth’s model/muse) was in attendance. They discussed their previous meeting with Wyeth and Nick explained how many of his drawings are inspired by Wyeth. When she saw Nicks drawing of “The Gate” . Nick was overwhelmed with her reaction to it. She said “I can see you were truly inspired by the Master on this piece”. Santoleri said “Art is my meditation and therapy”. Sometimes other artists will look at the detail in Santoleri paintings and say “I think I would go crazy if I tried to do that much detail’. Nick’s feelings are that would not feel fulfilled unless he gets lost in the intricate details of his work. Santoleri recalls “In the same way that my grandmother would crochet while watching TV and be shocked at how quickly she finished a blanket, I don’t realize the details of my buildings or grass until after it’s been done”. “When the art spirit moves through me, I get into an artistic trance. It feels like I’m riding a wave guided by the lead in my pencil. I tried to capture the overall experience last year (2011) in my drawing The Art Spirit“. This was particularly unusual piece for me but I think it explains myself better than any other. So many elements of myself are hidden in it. I am the dog in the far left corner. Early in my career this dog was an impatient Chihuahua. Over the years however I learned that these things will come in time. The dog is half-awake/half-asleep in a trance much in the way I get when creating. The art spirit is pregnant with the next idea it has to offer up to me. Finally the clock in the distance rests at 3:33am, the time I was born and the time I typically am at my most creative. Sometimes creative minded people have an inability to express themselves verbally. They turn to novels, paintings or photographs to express their emotions. For me the pencil has always been the easiest way for me to express myself emotionally and creatively. Almost all of my work regardless if the final piece is Watercolor, Acrylic or Oil Paint they originated as a Pencil Sketch. Some of them even grew into full Pencil Drawings. When I’m adding the watercolors I go out of my way to attempt to blend various techniques to create a final painting that is as realistic as possible combining Dry Brush and Wet on Wet. Whether I’m using Pencil, Watercolors, Graphite, Acrylic or Oil Paintings it’s always my goal to transcend the medium which I’m working within”.